Christmas, I love everything about it! Just as I wrote in my Thanksgiving post, this is my favorite time of year. To me the thought of Christmas is lots of family time. Christmas is about putting that tree up and decorating it with your loved ones, decorating your house with all the Christmas decorations you have, carrying or starting those family traditions. I have a lot in store for this Christmas, we are starting a family tradtion and I couldn’t be more excited! My daughter, Avarie, is finally old enough to have an understanding to how Christmas works and that includes santa. So far we have gotten to decorate the Christmas tree together and next I’ll be taking her to get her picture taken with santa. 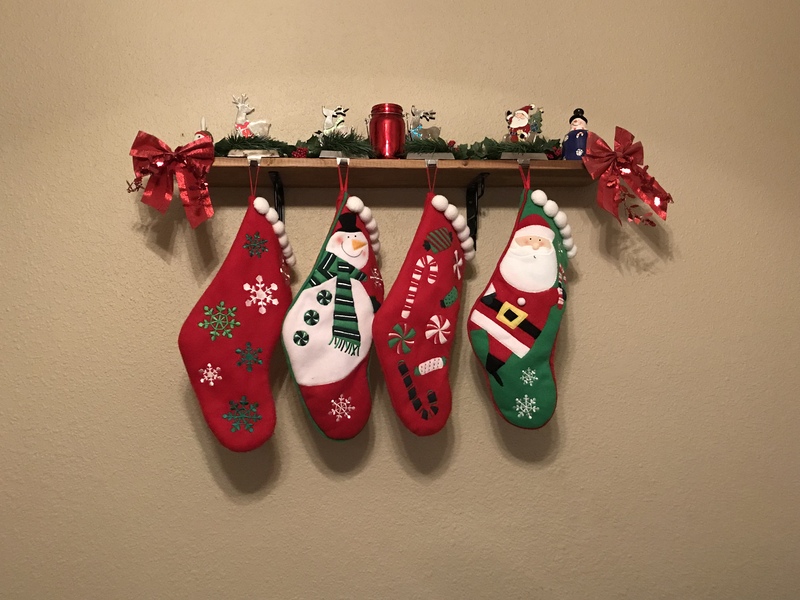 My husband and I hung up four stockings, one for each of us, and the fourth just for santa, because it does have a picture of him on it so it must be just for him anyways, right? I’m going to start the tradition of telling Avarie santas stocking is for santa and how she can color him a picture and put it in there for him to recieve when he comes Christmas Eve. We are also going to build a ginger bread house together sometime before Christmas; along with baking cookies, and setting milk and the cookies out for santa to eat on Christmas Eve. These are just fun traditons that I got to enjoy when I was a kid and I want to pass them on to Avarie! This time of year is so fun and I love the family time! Getting to see Avarie unwrap her presents and the joy it brings is all the gift I could ask for. This year we have six Christmas’s to attend…SIX, talk about a crazy Christmas! What are some traditions you guys like to maintain in your family? Don’t forget the reason for the season, and that is our Lord and Saviour Jesus Christ was born! Hope everyone has a safe and very Merry Christmas! !